The price of gold may have been tamed in recent weeks, but this limited edition reading glasses promise to hold their glitter for a long time. Only 300 pieces are being made, each marked with a unique number and complete with a lifetime warranty. 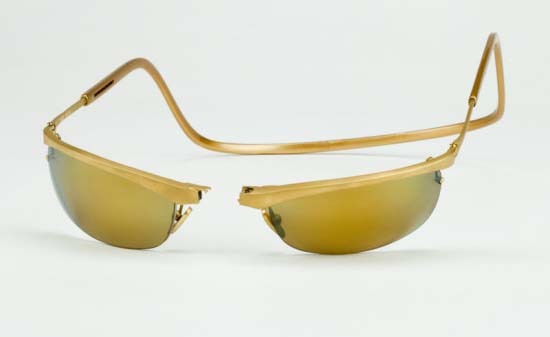 This is no ordinary piece of eye-wear priced at Dh275,250 ( $75,000 ), they are pegged as the worlds most expensive reading glasses, and are set in 18K solid gold. Manufactured by the CliC Golds, this unique piece of optical jewelry will be hosted by Al Jaber Optical at its store in Dubai Mall. Created by talented inventor Ron Lando, who will also be present at the showing on May 7th, the CliC Golds are sure to captivate audiences with their sleek design set in 18K solid gold; a rare hybrid of artistic genius and precise optical engineering. The glasses inventor and worldwide patent holder for CliC eyewear, Lando worked with internationally renowned jewelry designer Hugh Power to bring this vision to life. Each reader is hand crafted in 18K solid gold by the master jeweler in the United States using traditional, strictly detailed techniques. This means that every single piece takes approximately 50 hours to complete, with each set finished off with Landos patented magnetic front connection system. This system replaces the traditional temple and is an ultra-light moldable gold headband with 18K solid gold extendable sidepieces and an 18K solid gold expandable back made to ensure a custom fit. The glasses retail at $75,000 or approximately Dh275,250. Al Jaber Optical, who are presenting the CliC Golds to the public, are no strangers to innovation, and have a long-standing reputation as leaders in the regions optical market.